So you're taking the IELTS or the TOEIC the day after tomorrow (après demain)﻿﻿, and you'd like to find free resources online, get the method, learn the tricks and, most of all, practice. We've listed all the good places where you can practice for IELTS and for the TOEIC for free. We've also included extracts of All rights Reserved's method to master both the writing and the speaking part on the IELTS. Just click one of these buttons and it will take to our practice exercise. You may even send your answers for a review and customized tips from our contact page. It's free! 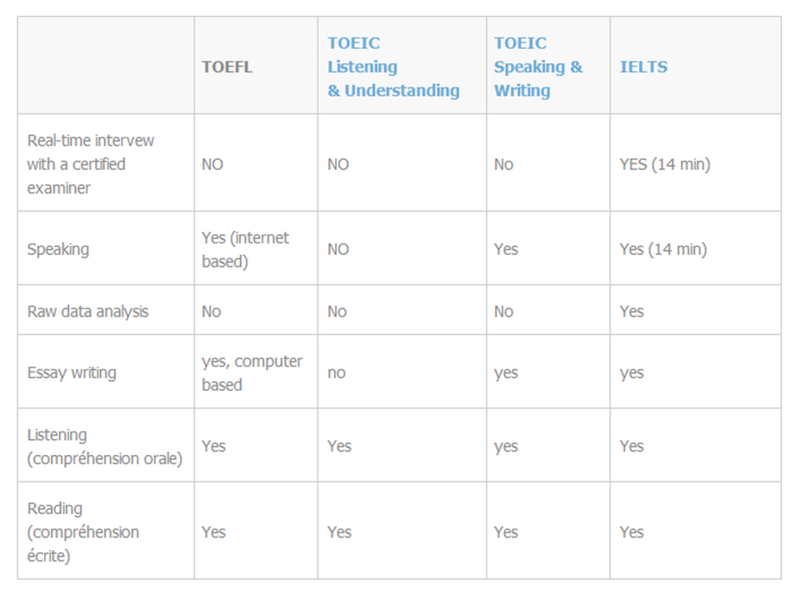 If you're wondering (se demander) about the differences between the TOEIC, the TOEFL or the IELTS, this page explains it all. Vous vous apprêtez à passer le TOEIC, le TOEFL ou l'IELTS après demain (the day after tomorrow) et vous souhaitez vous entrainer gratuitement, obtenir la méthode, et découvrir nos conseils de dernière minute? Nous avons compilé les meilleurs site pour s'entrainer gratuitement aux différentes épreuves de l'IELTS, du TOEIC et du TOEFL et évaluer son niveau en ligne. Si vous vous demandez (if you're wondering) quel test d'anglais choisir entre le TOEFL, l'IELTS ou le TOEIC, consultez notre guide comparatif des tests de langue standardisés. Si vous souhaitez commencer à vous entrainer dès à à présent, consultez nos exercices en cliquant sur les boutons ci-dessous. Envoyez-nous vos réponses par mail pour obtenir une correction rapide et des conseils personnalisés pour progresser rapidement. It's free! Where should I start practising for the IELTS? The IELTS is a British Concil test. To find a test location for the IELTS follow this link: Purchase from your test centre. You will need to select your country. If you feel you need to review some basics, watch these great videos from a US teacher to review grammar and vocabulary on youtube. They are called ﻿English ﻿Lessons with Adam﻿. Once you feel comfortable, you can start watching talks on ted.com. Your first stop shoud be at the BBC's 6-min English podcast. This organisation offers an outlay to many influencial and successful people to expose their take (their opinion) on life, social, health or environmental issues. TEDex and TED.com provide a wide variety of talks (discours) from key economic actors an other many topics in English. Chose anyone you like, and watch it once without the captions (subtitles) taking notes. Then check out the transcripts which you can download on the website. Watch it once without the subtitles and try to take notes. Watch it again with the subtitles to make sure you’ve understood all the words. You may even download the speeches in mp4. Where should I start practising for the toeic? 1/ Your first stop should be the ETS - Education Testing Service - the organization that makes the test. They explain all the good things that come with taking the test and progressing over time, on their site, and in the in the Examinee handbook that you can download for free. 2/ They also provide a detailed score overview, and a table called the the CAN DO table, which tells employers the strengths and weaknesses that come with a given score. 3/Also they have a correlation table which indicates how your score translate in terms of proficiency levels. There are three main levels (Basic, Independent, Proficient), and two intermediary levels (Basic Plus, and Independent Plus). An English user will be considered "Independent" according to TOEIC standards if he or she scores above 550. The only thing the ETS will not tell you is the applicable fee to take the test, because it depends on which country you are taking the test in. It currently ranges from US$75 to US$85. To find out the actual fee in your country, you need to contact a local test center. ETS provides a directory to help you find the one closest to your place of residence.